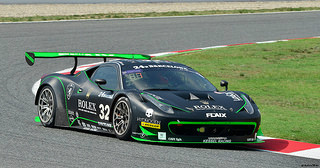 The 458 Italia GT2 sports car was launched in 2011, and alongside it, Ferrari launched the 458 Italia GT3 racer which, like its stable mate, was based on the 458 Italia. Additional weight reduction methods meant that the GT3 was slightly lighter than the GT2. The GT3's aerodynamics were improved by the addition of a different front bumper, enlarged air vents for more efficient engine cooling, very small windows, and alternative side skirts. The interior received liberal use of carbon fibre fitments. The Ferrari 458 Italia GT3 sports car was designed and developed exclusively with an eye to the track and, as such, was a world apart from the 458 Italia. It was not road legal, and had a dry weight of only 1214 kg, substantially less than that of the road variant. Using the same 4.5 litre, V8 power plant, developed by Michelotto, and fitted with two 43 mm air restrictors to meet the FIA regulations, plus a compression ratio of 13.1:1, it was able to develop 550 bhp at the redline of 9000 rpm, more in line with the 458 Italia's 562 bhp than that of the GT2's 464 bhp. However, modifications to the engine had, as their primary objective, the production of more torque, rather than an increase in output. To this end, the GT3 developed 406 ft/lbs of torque at 6000 rpm, compared with that of the 458 Italia of 398 ft/lbs. 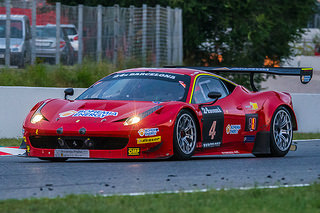 In terms of external appearance, the fact that the 458 Italia GT3 racer was lighter, lower, developed more torque, and had an aggressive rear wing made it a force to be reckoned with. In a summary of its race credentials, amongst its numerous place wins was that it was a four times winner of the 24 Hour race at Spa. 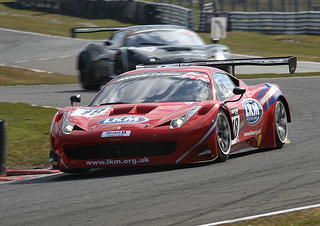 In fact, the 2011 event included a line-up of no less than seven GT3's.